3 down, 97 to go! Thanks so much to everyone who has contacted me about participating in a One Hundred Blessings quilt for Shepherd! So far I have received three beautiful fabrics and I am expecting a few more very soon 🙂 If you’d like to participate, I’d be SO grateful! So many of you have helped support us in this venture to bring our son home, it would be fantastic to see you guys represented in his treasured quilt. To learn more, visit Shepherd’s quilt blog: One Hundred Blessings. I’ll be posting pictures of all the fabric and blessings that I receive, it will be such a fun way to ‘count’ Shepherd’s blessings! This is such a cool thing to do. It is going to be beautiful. What Fun! 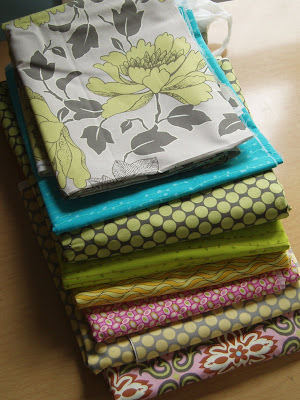 I love Amy Butler fabric…I think thats her stuff…very pretty. I’ll send mine…as soon as I have aminute spare! I’m in :O) I still need 50+ for my girl, now that you’ve reminded me!